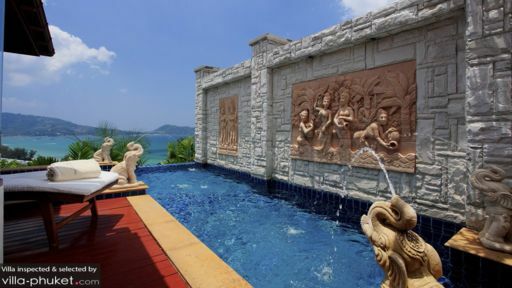 Located inside a private villa complex, L’Ochidée Complex near Patong beach, Villa Cattleya 10 is one of many private holiday homes offering luxurious accommodation at affordable rentals to guests traveling to Phuket. With views that span across Patong bay and the neighboring areas, guests will feel relaxed and rejuvenated after their stay in the most comfortable and inviting ambiance. The complex itself offers many amenities to guests that they can avail without a worry! The ground floor of Villa Cattleya 10 is home to the three bedroom suites that have been furnished to offer the best of comfort and style. The master bedroom is furnished with a king-sized bed and adjoins to a balcony which offers a beautiful view of the island. It has an en-suite bathroom that even has a whirlpool tub for a tranquil and soothing bath. The second bedroom has a queen-sized bed and the third bedroom has single beds as well as bunk beds. The last two bedrooms share one bathroom, creating a nice family compound for guests that are traveling with kids. Apart from the common pool in the complex that guests can use, the villa itself has a private infinity-edge swimming pool which is fed by stone sculptures. There are sun chairs on the pool deck, perfect for lounging after a long, hard swim in the pool. With abundant greenery and lush foliage all around, there is the fresh air that you can breathe in and truly immerse yourself in untamed nature for a glorious and exhilarating time. An outdoor lounge area on the terrace with a sitting area and an alfresco dining table has been set up for guests to enjoy a hearty meal all the while relishing the remarkable panoramic vista of the island and its beaches. As you step inside from the terrace, you will be greeted by the living area at Villa Cattleya 10, as it is an open-plan layout. There is a lot natural light and fresh air due to the design, and you can relax on the comfortable couches and chairs as everyone gets together for some lovely quality time. There is a small media lounge in the corner with cozy sofas and a flat-screen TV, as well as a daybed for afternoon naps. From here too, you can view the beaches and enjoy a dazzling scene outdoors. With a traditional high-vaulted ceiling featuring exposed wooden beams, the space is decked in a homely fashion for your ease. Another dining area with a six-seater dining table is found in the living area, and it is strategically placed right beside the entrance to create a spacious area for a BBQ or an afternoon party with friends and family. You can even prepare your meals and cook up a storm in the fully-equipped kitchen that has been fitted with a variety of modern appliances and amenities for your convenience. An excellent team is at your service during you stay at the villa, and they will ensure that all your needs and requirements are met. At an additional charge, the chef can prepare your meals and introduce you to the delightful flavors of Thai cuisine. The complex gym can be used at an additional cost and in-house massages can also be arranged. 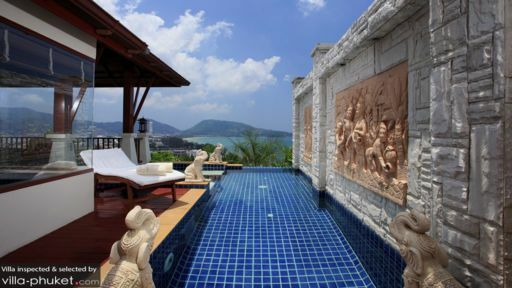 Since Patong is the most happening stretch of Phuket, there is a lot that you can do around the villa. Patong beach is merely 300 meters away and is home to some of the best restaurants, clubs, and beach bars. There is Joe’s Downstairs and White box for drinks, and Pan Yaah for Thai food that you can explore! Thank you Stephan and L'Orchidee staff for another memorable stay! The villa was lovely, as is always the case. The service and security second to none. 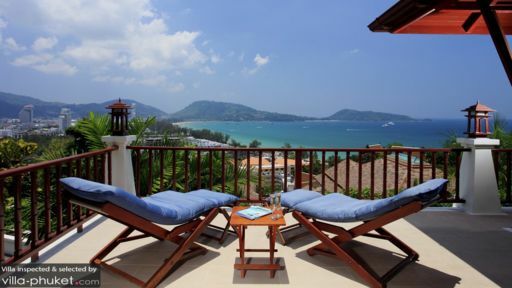 The view is the best in the whole of Phuket, and the location is perfect for shopping, sightseeing and nightlife.